New year, new works from double cast master Scott Wilkowski! Check out these three “Infected Lions” in Translucent Jade, Clear Pink, Royal Purple resin. Right on time for some CNY celebrations, Scott once again demonstrates how to double cast correctly whilst showing his “infected skeletons skills”. Scott Wilkowski signature infected double casting needs no introduction right? 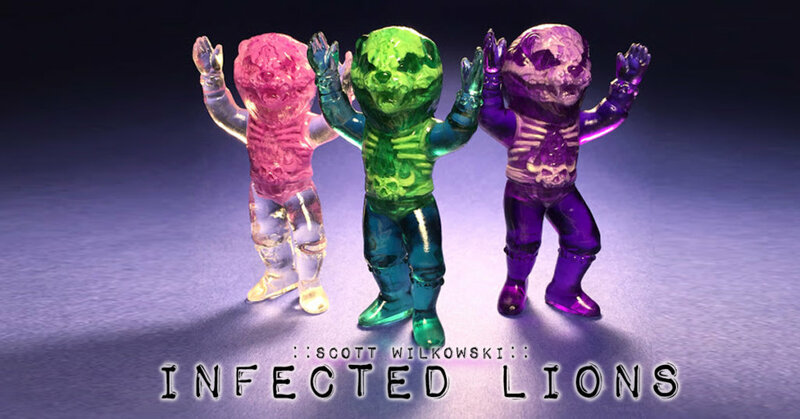 Infected Lions stand at 3 1/2″ and now ready for pre-order with limited availability. PRICE: $75 each + $5 shipping to North America. Overseas orders please send an additional $15 via Paypal. Orders may take up to four weeks for delivery.